If you know me, you’ll know that I love plantains. I like them boiled, roasted, pan fried, deep fried or baked. I’m a lover of anything plantains and for the record, it’s my favorite. I can hide dodo for Africa. 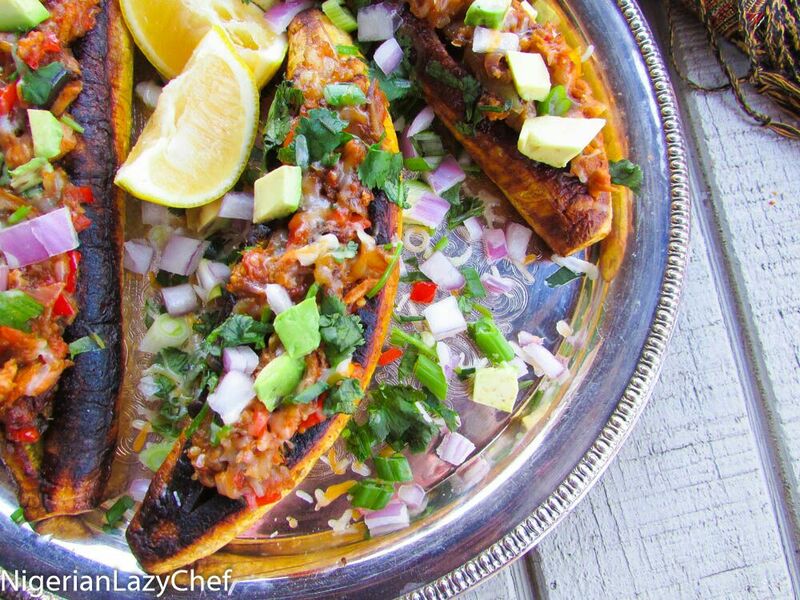 Stuffed plantains are simply plantains roasted and stuffed with whatever filling to one’s desire. The fun, but healthy thing about this recipe is that, it’s baked; especially with fit fam these days. You can even have this for a treat on your cheat days; even half of one stuffed plantain goes a long way. If you have kids who love plantains, trust me when I say they would love stuffing the plantains. Experimenting with this recipe was exciting as it’s gluten free and hearty enough to feed a hungry ajebutter. Immediately he walked into the house, he asked “hmm mommy what’s that smell?” and I knew he was going to love it; and without taking off his clothes, he wolfed down one whole stuffed plantain….Eureka! Pre heat the oven to 375-400 degrees. place a foil wrapper onto a baking sheet and coat with the tsp of oil. Cut both ends of the plantain with a knife; then slit the skin of the plantain(only as deep as the skin goes) and peel. place the plantain onto the sheet and into the oven. Bake for about 10-15minutes on each side. Once done, Sprinkle on a little salt if using and set aside to cool. heat the tbsp. of oil. Add the onion and sauté until translucent. Add the garlic and mix until fragrant. Stir in the tomatoes and peppers and stir fry on medium heat. Once reduced, add the roasted egg plants and cook until well done. Add the shrimp and seasonings and cook until the shrimp has turned pink. 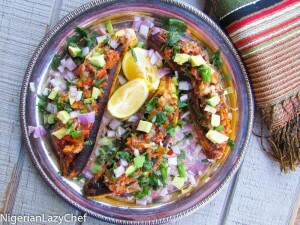 This entry was posted in baking, Breakfast, gluten free nigerian recipes, Healthy Nigerian, Lunch, main dishes, Plantain Recipes, Uncategorized and tagged Gluten free recipes, Nigerian food blog, plantain boats, plantain recipes, stuffed plantain recipes.